There are a lot of scam artists out there and the latest scam involves unlawfully using the name of a lotto winner who pocketed a $218 million jackpot in 2012. 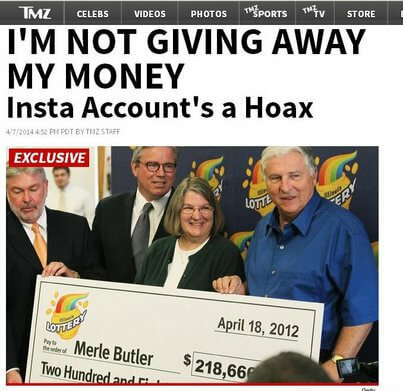 A fake Instagram account was set up using the name of lotto winner Merle Butler. A message from the fake account said she will mail $1000 checks to the first fifty who register as followers of the account. In a testament to just how many gullible people there are, the fake Instagram account soon had 112,000 followers. A more recent message asked people to donate $0.99 for postage. Ms. Butler denied she is giving away her money, and authorities have been asked to investigate.